Stefano Fontana first appears in at Painesville, Lake County, Ohio, between 1913 and 1917. He may have migrated to Painesville with his brother Antonino Fontana in 1915. In America, Stefano Fontana was known Steve Fontana. Stefano Fontana, son of Salvatore Fontana and Santa Caporrino, was born on Sunday, April 6, 1890, at Tommaso Natale, Palermo, Sicily. Stefano married Rosalia Vassallo sometime before 1913. Stefano Fontana immigrated to the United States on May 7, 1913, at age 23, travelling to Strausburg, Pennsylvania. He was joining his brother, Antonino Fontana, in Pennsylvania. He left his wife, Rosalia Vassallo, in Palermo. 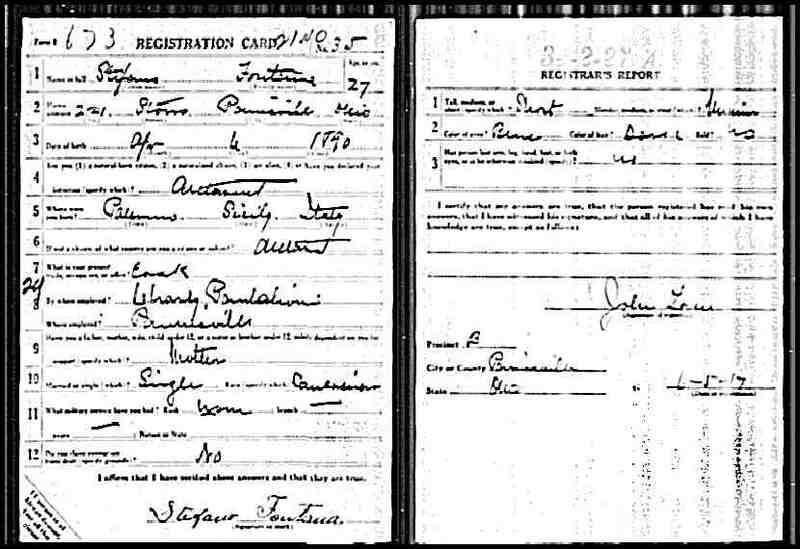 Stefano registered for the military draft for World War One on June 5, 1917. He was living at 221 Storrs Street, Painesville, Lake County, Ohio. He was employed as a cook in Painesville. The Draft Registration card said Stefano was not married. Mr. Fontana owned a restaurant in 1921 when his brother Antonino Fontana was murdered. He apparently left Painesville sometime after 1921. Stefano Fontana’s brother Antonino Fontana was also a Painesville Italian. Painesville Italians Salvatore Caporrino, Giuseppe Caporrino, and brothers, Pietro DiMaggio and Salvatore DiMaggio were probably related to Mr. Fontana’s mother, Santa Caporrino.